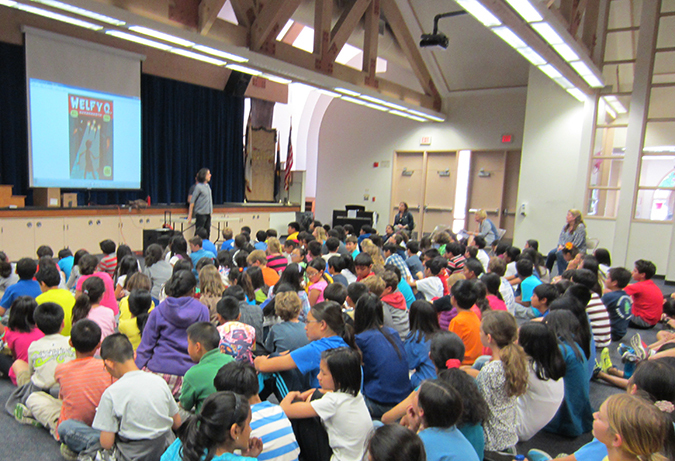 On Monday, April 28, Max and I drove to Irvine, California’s Westpark Elementary School, where two large groups of 4th, 5th and 6th graders crowded the media room after lunch to learn about Welfy and write stories with me using words from the book. Max and I also answered questions, distributed books and bookmarks, and could have taken twice the time allotted conversing with the kids! We thoroughly enjoyed the experience, and owe it all to librarian Ingrid Green, active parent Wendy Liao and a bunch of smart elementary school students. Thanks to everyone for your enthusiasm—keep reading!